Marty McFly’s iconic self-lacing Nike Mags just got a smart-phone upgrade. 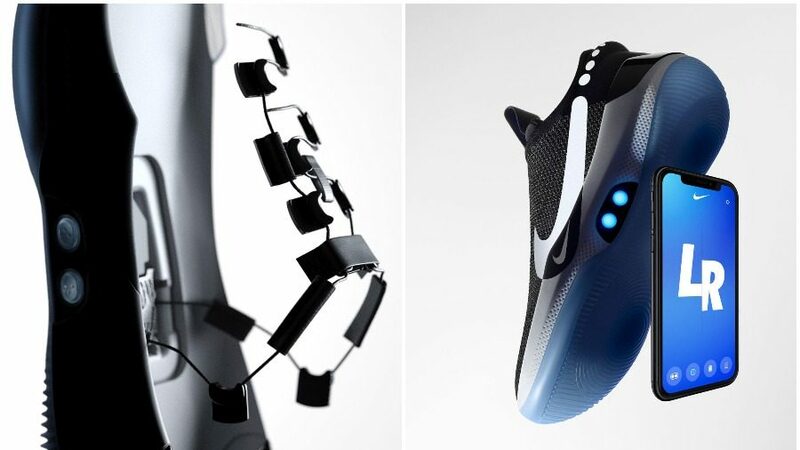 Inspired by the film “Back to the Future II,” Nike has cooked up a new basketball trainer with a “lace engine” that remembers the perfect tightness via a smartphone app. Nike released the first ever self-lacing shoes in 2016, one year too late for fans of the classic 1980s movie, “Back to the Future II,” which was set in 2015. The film correctly predicted various inventions that were to appear in the following 30 years, including hand-held gaming consoles, video calls, hoverboards, and biometric devices. 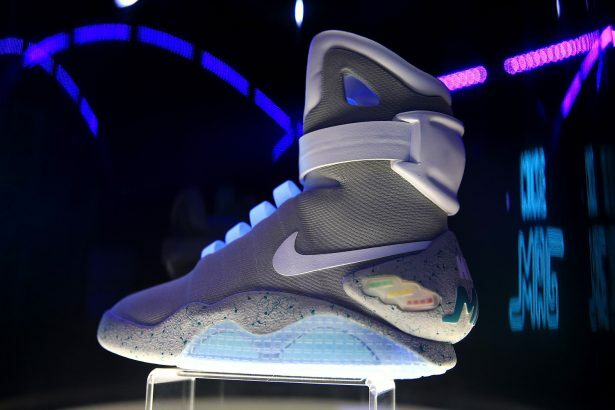 The film also featured hero Marty McFly’s iconic self-lacing Nike Mag tennis shoes. Nike has now created the Adapt BB, on sale from Feb. 17, which gives those Mags an upgrade, incorporating the ability to adjust the shoe … on the fly. “Over the course of a basketball game, the foot can expand almost a half-size during play. A level of fit that feels comfortable at one point might feel constrictive just 24 minutes later,” said a Nike statement on Jan. 15. If the athletes don’t feel like bending down to press the buttons on the trainers, they can use a smartphone app to adjust the tightness. The app can remember different lacing tensions. “Players can input different fit settings depending on different moments of a game,” according to Nike. 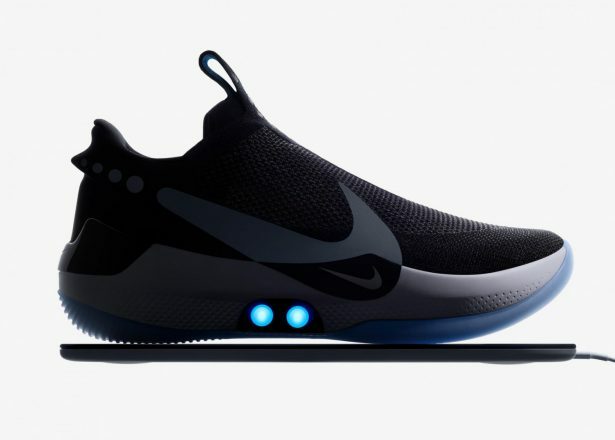 Nike picked basketball as the first sport for Nike Adapt because of the demands that athletes put on their shoes, said Eric Avar, Nike VP Creative Director of Innovation. “During a normal basketball game the athlete’s foot changes and the ability to quickly change your fit by loosening your shoe to increase blood flow and then tighten again for performance is a key element that we believe will improve the athlete’s experience,” Avar said. When someone steps into a pair of Adapt BBs, the shoes sense the tension needed in the foot and automatically tighten the shoe to a snug fit with the custom motor and gear chain. “The tensile strength of the underfoot lacing is able to pull 32 pounds of force (roughly equal to that of a standard parachute cord) to secure the foot throughout a range of movement,” according to Nike. The film was released in 1989, and was set in a futuristic 2015, where skateboards had been replaced with hoverboards, and cars could all fly. Nike’s VP of Innovation, Michael Donaghu, stopped short of saying that Nike had reinvented the wheel, but was confident to cast it in the 5,000-year history of the shoelace. “It remains, somehow, despite its imperfections,” he added. But the entering the future isn’t cheap. A pair of Adapt BBs—complete with a charging mat for the internal battery—will set you back $350. For those who can’t afford or obtain a pair (they are expected to sell-out instantly), they will just have to keep exercising their fingers, plugging away with the imperfect 5,000-year-old tech.